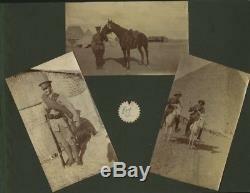 A photo album from a member of the Wellington Regiment of the New Zealand Mounted Rifles, taken in Egypt. I think it is from 1915, based on there being a lot of photos of the troopers parading on foot and wearing infantry-type kit, which would imply it's before deployment to Gallipoli. Only one person is named - Roy Carter. 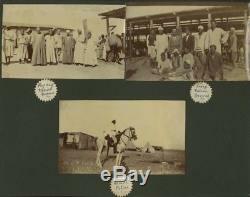 There are 70 photos, including two of family members. 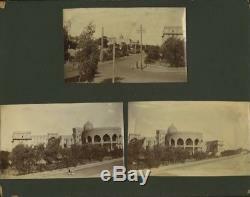 The rest are split between 36 that I would categorise as'military' - camps, supply dumps and wagons, troops, parades, stables, Egyptian labourers, and hospitals (including Abbassia and Luna Park, Cairo) - and 32 that I would call'tourist' - Cairo, Heliopolis, Cairo Zoo, Zeitoun, Pyramids & Sphinx. The album is in good condition for its age. The edges are a bit worn and some of the corners bent. Overall, album is 17.5cm x 23.5cm. 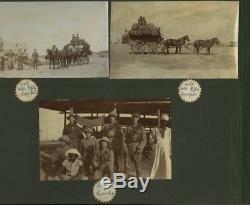 The item "New Zealand/Wellington Mounted Rifles photo album, Egypt, 1915, WW1" is in sale since Wednesday, July 18, 2018. 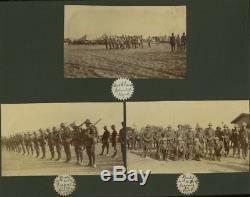 This item is in the category "Collectables\Militaria\World War I (1914-1918)\Photographs". 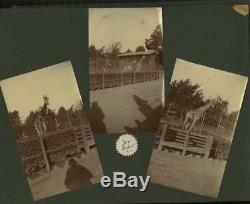 The seller is "sh24279" and is located in Aylesbury. This item can be shipped worldwide.